Large Industrial Site formerly occupied by American Crane & Rigging that is fenced with 17,652 sq ft of shop area, 1,952 sq ft office building, 540 sq ft safety office and numerous other support buildings. Drive thru shops with (2) 15 ton overhead cranes. Easy ingress & egress for 18 wheeler off loading. Excellent accommodations that are suitable for any industrial or commercial fabrication shop. 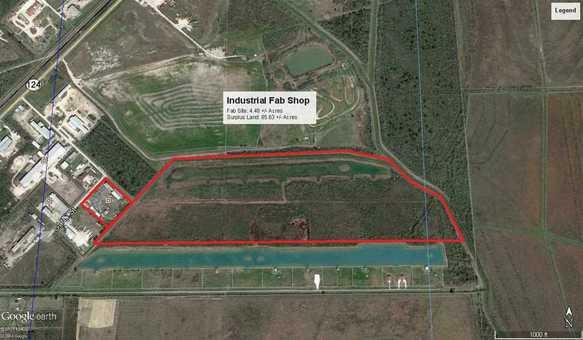 Fenced fab shop, office and support buildings situated on 4.48 +/- acres with additional 85.63 +/- acres attached to rear of property. See aerial photo for overhead view. Subject property is considered DISTRESSED SALE. Call Agent for details and showing instructions. Combo lockbox on main gate. Overhead Door Width: Fourteen Ft.